Worldwide introduces the Scrape-Scrub Mop grip. 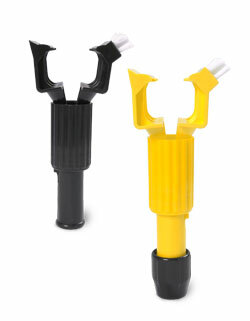 Jaws style mop grips are preferred for their mopping function and ease to change heads. Now it is available as a 3-in-1 cleaning tool, a traditional mop grip, a scrape edge to peel up gum or stubborn debris and a scrub brush to remove scuff marks. Another product innovation to make cleaning easier. Patent pending.